In response to In formation III’s investigation into the connections between institutional structures and perceptions of the psyche, Toronto-based artist Mitchell Akiyama develops a site-specific installation in the Studio. Utilising sound and light and their affective relationship to bodies both present and absent, Akiyama actuates the architectural and infrastructural elements of the space, transforming it into a pulsating, seething and inscrutable presence. 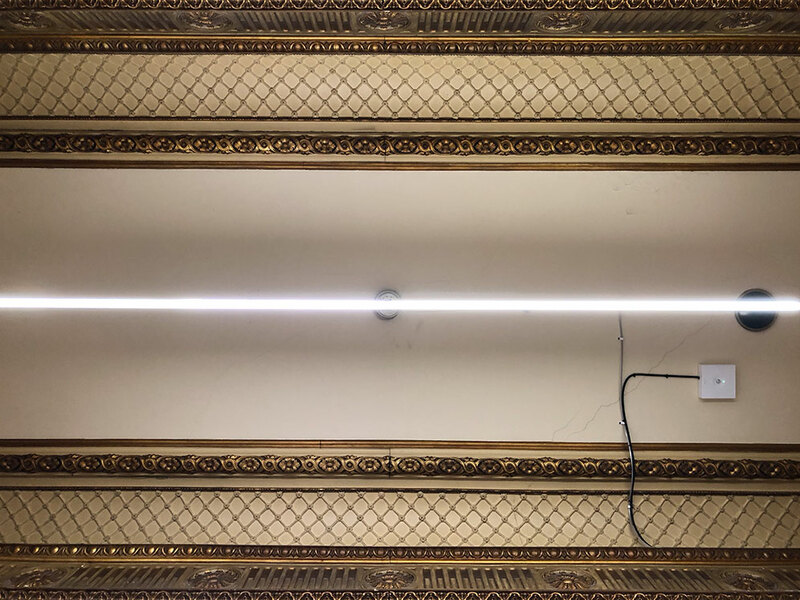 Tuning the space to its own material and energetic potential, this multisensory installation is a haunted house, a sick building, another room speaking back. Mitchell Akiyama is a Toronto-based scholar, composer and artist. His eclectic body of work includes writing about sound, metaphors, animals and media technologies; scores for film and dance; and objects and installations that trouble received ideas about history, perception and sensory experience. He holds a PhD in communications from McGill University and an MFA from Concordia University and is Assistant Professor of Visual Studies in the Daniels Faculty of Architecture, Landscape and Design at the University of Toronto. With thanks to Maria Yablonina for installation design support. Please note that this installation contains flashing lights.